I ate fried chicken at 30 establishments – from Galatoire’s to a Shell station, from Popeyes to a supermarket steam table – before compiling this Top 10 list. My original tasting wish list was double that number. I stopped eating at 30 because, unlike fried chicken in New Orleans, at a certain point time and funding become limited. I stuck to places that serve chicken fried in the American-Southern style. Bones were requisite. So, no chicken tenders. No chicken fingers. No boneless chicken sandwiches – not even the many tempting ones around town that set out to best Chick-Fil-A and succeed. I always ordered a mix of white and dark meat when possible. I tasted the chicken within minutes of receiving it, including at locations without tables. I walked out of some places upon realizing that they only offered chicken wings, as wings are a genre unto their own. The one exception was at Ma Momma’s House, where I stayed because of the hot, buttery, cornbread waffle that a server delivered before I finished reading the wings-only menu. I shall never apologize for that wise violation of my own fried chicken rules. The greatest discovery of this fried chicken quest was not any particular version of the dish, but rather how many exceptional versions this city supports. A Top 20 list wouldn’t be as compelling, but I could have compiled one in good conscience. This is a city of under-heralded fry cooks. If you eat fried seafood, you already knew this, as I did. But, when offered a choice in this town surrounded by water, I’ve historically chosen catfish or shrimp or oysters when in the mood for something fried. I now know that fried chicken isn’t only a safe bet, especially in our most community-oriented neighborhood restaurants, but often the best choice of all. Most native New Orleanians I know name Popeyes as their gold standard for fast, super-seasoned, inexpensive, take-out, available-on-most-holidays fried chicken. McHardy’s is mine. Kermit Mogilles, who runs McHardy’s with his wife, Alvi, and son, Rahman, used to be a commercial banker – until, as he told me, he got bored of all the meetings. He isn’t sure he would choose fried chicken if he had to start over, because it’s “too laborious.” To begin, the Mogilleses use only fresh chicken, no more than three days from killing. They wash, trim and then wash each piece again. The chicken then marinates for up to two days before cooks season it, dredge it in a mix of flours and fry it to a reddish brown hue. Mogilles won’t get more specific than to say that McHardy’s seasoning blend contains eight spices, some of them “expensive.” It doesn’t show in the prices, which are comparable to Popeyes’. The most surprising thing about Joey K’s fried chicken isn’t that it’s exceptionally rendered, but that it hasn’t been on the menu for very long. Proprietors Cindy and Sam Farnet added it just a few years ago. Joey K’s is a dependable, greatest-hits kind of New Orleans neighborhood restaurant (red beans and rice, shrimp remoulade, fried seafood, poor boys), including some equally strong B-Sides (corned beef and cabbage, stuffed peppers, stewed chicken, liver and onions). Chef Darren “Smitty” Smith’s topographically complex, thickly double-battered fried chicken fits right in. It is slaked with seasoning throughout, including a nice humming heat, and served so fresh from the fryer that it took 10 minutes before I could safely take a full bite. I tried twice to attain Terri Lawson’s fried chicken technique, once by playing naïve customer and asking her, and once by calling the owner of Buddy’s Poor Boys, Tony Montoya, and asking him. Lawson shook her kitchen towel, threatening that if she told me her secrets she would have to kill me. Her boss was no more forthcoming, reporting that if he revealed her secrets, she would kill him. 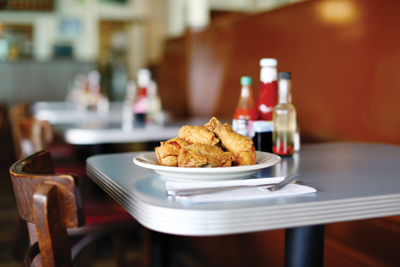 Such is the pride of a fry cook who consistently turns out pepper-and-spice-speckled chicken with a fried skin that at once shatters and melts in the mouth, like Acadiana’s best cracklin’. There is a brightness to the fried chicken at Buddy’s that suggests lemon pepper and a back flavor of something like garlic powder, but those are just guesses of course. While you could order Buddy’s chicken with sides of slaw and potato salad, I recommend the Garlic Loaf preparation, for which Lawson places the fried half-bird atop two slices of severely garlicked and toasted French bread. “There was a lot going on with this chicken,” is the first tasting note I jotted down after trying Thursday’s $10 fried chicken lunch special at Borgne. Indeed, as chef Brian Landry later explained, Borgne’s cooks brine and then marinate chicken leg quarters before cooking them sous-vide for three and a half hours and then flash-frying them in cottonseed oil. Additional bonus for some eaters: This is a gluten-free fried chicken, dredged in cornstarch instead of flour for maximum crisp. The sweet heat of housemade pepper jelly sticks to the chicken and coats the bottom of the cast iron skillet in which it’s served with a freshly baked buttermilk biscuit, wilted greens and fluffy mashed potatoes piped into undulating waves. Chef-proprietor Jack Leonardi’s kitchen puts out a perfectionist’s plate of fried chicken. Juicy, seasoned meat; lightly golden, crenellated batter; zero grease on the plate. The chicken’s presentation still honors Austin Leslie, the late Creole chef who over a long career made a solid culinary mark in New Orleans, most notably for his fried chicken, which for a time he cooked at Jacques-Imo’s. Jacques-Imo’s cooks scatter the fried chicken with Leslie’s signature garnish of pickle chips and garlicky persillade. It isn’t clear, though, whether Jacques-Imo’s current fried chicken recipe otherwise resembles the deceased chef’s method (Leslie used to tout canned milk, while Jacques-Imo’s cooks today use buttermilk). For serious fried chicken enthusiasts, it won’t matter. Tuesday is officially fried chicken day at High Hat Café. That is when it’s plated with braised greens and pimento macaroni and cheese. But you can also get it with red beans and rice on Mondays and with a waffle and eggs on the weekends. My advice is to use whatever excuses it takes to eat High Hat’s fried chicken as often as possible. Chef Jeremy Wolgamott and his crew brine chickens before butchering them, which ensures a finished product that’s as tender inside as it is crunchy outside. But it’s the mostly cornmeal dredge that they pass it through before frying it (they prepare their excellent catfish similarly) that truly sets High Hat’s chicken apart, giving it a unique pebbly texture and a nutty corn flavor that’s so complementary to chicken – and fantastic with cane syrup on the weekend – you wonder why it isn’t more commonplace. Willie Mae’s is a peppery, wet-battered, hard-fried chicken that never looks quite the same but always makes me question why I don’t eat there more often. The skin was dark enough to cause worry on my most recent visit, but fortunately it crackled delicately, like fried lace, and tasted meaty, clean and a tad “too spicy” for the kids at my table (more for me). Just like always. When I interviewed Willie Mae Seaton, the restaurant’s founder, in 2006, she told me that she bought whole chickens and butchered each one herself. A lot has changed since then. Her restaurant underwent a total rebuild and expansion following Hurricane Katrina, thanks to private dollars and volunteer labor. Her great-granddaughter, Kerry Seaton, now runs it, keeping tight-lipped about the family recipe. Chubbie’s looks like just another fast food outlet with its drive-up window and small indoor dining area, when in fact it’s good enough to be a regular destination for all metropolitan area fried chicken lovers. Chubbie’s fried chicken has no bells or whistles – the seasoning is subtle, the chestnut-colored batter simply crisp – and that’s exactly what makes it exceptional. It does possess a sort of umami quality, a little extra savory oomph, that proprietor Julie Mire attributes to the lard and vegetable oil blend that Chubbie’s cooks use for frying. It is rare to find such home-cooked-tasting food at this price point served this quickly. The chicken holds up well for a short drive home, but does benefit from being eaten sooner rather than later. In my imagination, cooks at Fiorella’s spend long prep hours massaging flour and seasonings into chicken pieces before frying them. How else to account for the way Fiorella’s peppery, borderline spicy batter sneaks into clefts and crevices that chicken pieces in other restaurants don’t even seem to possess? It must have been an optical illusion, but I swear I found batter inside one of the chicken breasts I ate. Fiorella’s is a dark, weighty batter – the kind that would hold up well on a picnic – and while the meat somehow remains tender, the chicken is fried so hard that even its internal bones appeared singed. According to General Manager Tristan Mallet, cooks marinate the chicken in a dry rub for 24 hours before passing it through a dry, seasoned flour dredge and frying it in a soy-based oil. It is an all-too-simplistic description that perfectly illustrates just how important technique and personal touch are to frying chicken well. Munch Factory’s fried chicken isn’t quite American-Southern enough to include in the Top 10 list, but it’s close enough – not to mention delicious – to deserve mention. Chef Jordan Ruiz and his team batter and lightly pan-fry half a partly deboned chicken to achieve a nice outer crust and some traditional southern-fried flavor. They finish cooking the chicken in the oven and then embellish it with a fine herb cream sauce that has a savory depth I’m guessing comes from pan juices. Add garlicky green beans and potato-tasso croquettes and you have Colonel Sanders meets “Larousse Gastronomique” in Gentilly. Is there a typical New Orleans-style fried chicken? Besides Popeyes fried chicken, that is. It goes without saying that Popeyes, which the late New Orleanian Al Copeland founded in 1972, and which has since spread to more than 2,200 locations across the globe, is synonymous with New Orleans. Popeyes fried chicken might not appear on my Top 10 list, but I fully acknowledge its cultural import and its required attendance at Carnival parade parties and during Saints football season (reportedly the Saints players themselves eat Popeyes before games for good luck). Change and/or filter fry grease frequently, even several times a day when volume is high. Use clean chicken, trimmed of excess fat and rinsed well. Use super cold chicken; the colder the chicken, the moister the meat will stay and the better the batter will stick. Brine, brine, brine; most of the Top 10 chickens spend some time in a saltwater solution, a process that cooks who use it believe promotes moisture in the finished product. Most of the contenders in this list use dry-rub marinades and dredges, versus wet batters. When I first came to New Orleans, I found the restaurant custom of offering meat (chicken, pork chops, sausage links) as a side dish to Monday’s red beans and rice hilarious. Fried chicken as a side dish? I have since gotten over the semantics and come to crave the combination of brittle, battered chicken skin and earthy, smoke-tinged beans – preferably with the bright overlay of hot sauce. I ordered them every time red beans were on the menu during my fried chicken marathon, and I can’t say that a single version disappointed. Following are some additional memorable side dishes from my recent tour. Pork-infused white beans at Lil’ Dizzy’s Café. Turnip greens stewed with pork and potatoes at Dooky Chase Restaurant. Simple, creamy butter beans at Willie Mae’s Scotch House. Skinny, hand-cut fries at Elizabeth’s Restaurant. Pimento macaroni and cheese with a browned top layer at High Hat Café. Vinegary diced beets, plus genius cole slaw with apple at Jacques-Imo’s Café. Meaty, fresh rice dressing at Chubbie’s Fried Chicken. Wilted spinach Lougia shot through with shards of garlic at Liuzza’s Restaurant & Bar. Bacon-crammed pinto beans at Pollo Campero.